While its relations with Pyongyang is very strategic owing to historical influences, China has said its diplomatic channels with North Korea remain open. Tensions escalated in the Korean peninsula on Tuesday as North Korea celebrated its military anniversary with a massive conventional firing drill even as a US guided-missile submarine docked in South Korean waters to check Pyongyang’s nuclear ambitions. Speculations were rife that the North could possibly test its sixth nuclear missile to commemorate 85 years since the founding of its army. Although no such event took place today, Seoul said Pyongyang was conducting a ‘massive fire drill” in the port city of Wonsan. To discuss the prevalent situation, envoys from the US, Japan, and South Korea had met in Tokyo. In a statement to the media today, Japan’s Chief Cabinet Secretary Yoshihide Suga said the three envoys spoke about staying on the same page amid escalating tensions. Meanwhile, a US nuclear-powered submarine was docked in Busan. But Seoul said it might not participate in joint naval exercises with South Korea. 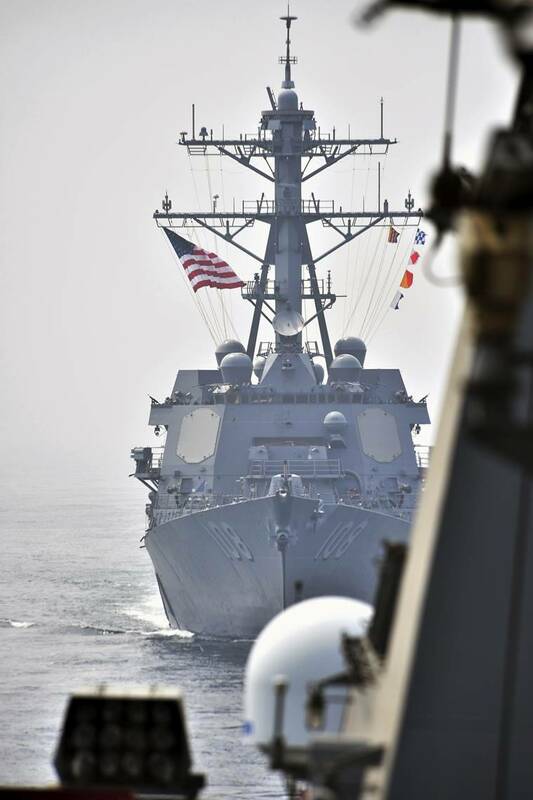 South Korean Navy’s spokesperson told Associated Press that the USS Michigan made a routine stop to reload supplies and rest its crew members. USS Michigan arrived on the same day as North Korea’s military anniversary celebrations. If history is any indicator, North Korea usually marks important dates with a massive show of military might. In a show of force, US President Donald Trump has sent an ‘armada’ of ships, which include an aircraft carrier. There also seems to be an air of unease between US and South Korea as reported by a clutch of South Korean newspapers. Some have questioned whether Trump is deliberately keeping South Korea out as he realigns his North Korea strategy. Trump reportedly skipped calling Seoul during his telephone conversations with Beijing and Tokyo over North Korea’s belligerent actions. One of the South Korean newspapers, The Maeil Business Daily, claimed on Tuesday that Trump not calling the South Korean Prime Minister was evidence that relations between the allies are “not normal.” The paper also said that Washington is yet to name its new ambassador to Seoul nearly three months after the departure of Mark Lippert. It further questioned whether Trump has ‘entirely left out South Korea in his picture for the Korean Peninsula’. Another daily, the JoongAng Ilbo, wrote an editorial saying Seoul shouldn’t be left out from important discussions involving North Korea as “the destiny of our nation could be at stake.” Local media has often termed Seoul as “Korea Passing” as it increasingly appears to be losing its voice in the international arena to deal with Pyongyang’s nuclear threat. While its relations with Pyongyang is very strategic owing to historical influences, China has said its diplomatic channels with North Korea remain open. China’s foreign ministry spokesperson told the media on Tuesday that Beijing urges all sides to exercise restraint and refrain from any actions that could push tensions even higher. It’s interesting to note than despite China being an ally, North Korea has repeatedly snubbed Beijing’s calls to comply with UN resolutions on its nuclear programs. Ever since Kim Jong Un assumed power in 2011, he has rarely met with Chinese officials much less visit the country that offers his regime foreign trade and plenty economic assistance. The seemingly lack of any meetings between the two communist countries have raised questions about their friendship.